But how do you measure that bang? Is it in the comics you can buy? Is it in the guests that you can meet? Or is it in some other intangible way? Over the last weekend I attended two events on either side of Scotland and both had their merits and reasons for attending. Glenrothes Comic Con was just 15 minutes from the house so I could not miss that. And with guests such as the nicest man in comics, Mike Collins and the equally talented Will Simpson, it was a no-brainer to attend this event which had been organised by one of my favourite Dan Dare artists, Gary Erskine. And for me, it was a success as I ended up picking up a few British comics and doing a rather good deal with Colin Mathieson of Accent UK. Suffice to say that he is a Ted Rawlings fan. And the other event I attended can best be described as Comic conventions’ best kept secret and that is the once again annual pilgrimage to Moniaive. Organised by Sue Grant, it boasts a number of seriously big guns in its’ line-up with Nigel Dobbyn, Hunt Emerson, Monty Nero, Doug Braithwaite and Dave Kendall in its’ line up for 2017. Although I got there on the Sunday and I missed getting a Firkin by a cat’s hair, I was not disappointed. 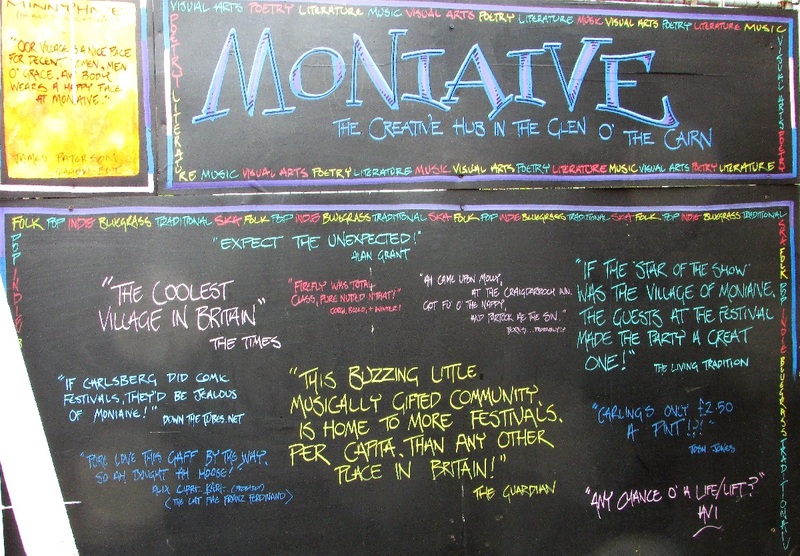 For when I arrived, the first thing I saw was the quotes board which is used to promote the village and the local community and to see one of my comments staring back at me was a rather nice boost to the ego. The second thing that happened to me was astonishment at the number of people asking about what I was doing there as I had said that I had cancelled due to a number of personal issues. Not only were they asking about me, but were also asking if herself had come along to the convention. And for that act alone, Moniaive probably qualifies as the friendliest con ever. I did get to watch Dave Kendall do a wonderful sketch that has pleased herself and I attended two panels. 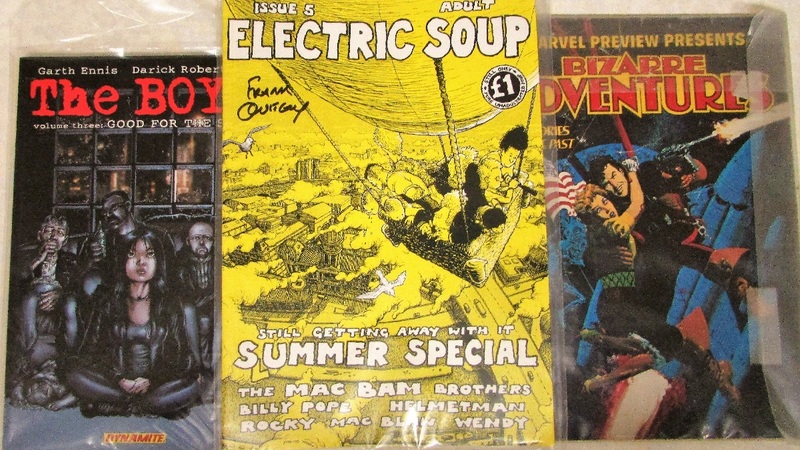 I also picked up issue 5 of Electric Soup at long last. It goes well with the fact that I have the original art for that cover. 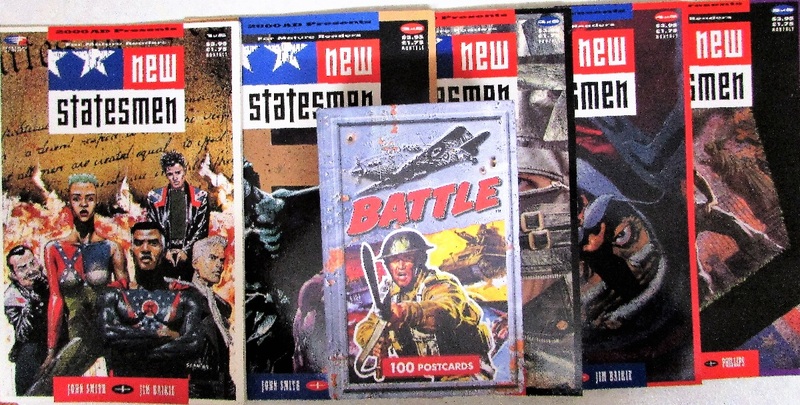 And I picked up a few other bits and pieces that go well with my collection. I will admit that the panels I attend are few and far apart. The last one I attended was the Comic Book Men one at Edinburgh Comic Con in April 2017. The panel before that was at the opening of the Dundee Comics Creative Space in October 2016 and the one before was the tail-end of John McShane’s talk at last year’s Moniaive on Britain’s first regularly published comic, the Looking Glass which was first printed in 1825. Now I did get “persuaded” to attend the first panel by the dynamo that is behind Moniaive Comic Con, Sue Grant. I think that there may have been a threat of never being served in this village again that acted as the impetus, but nonetheless, we all trooped in to attend Nigel Dobbyn’s Creative 101 on how a little thought on your layout can go a long way to making your art help to tell the story rather than hinder it. As a fan, I know my artistic talent is somewhere between stick men and suspect perspectives, but I learned to deconstruct some of the stories that I really enjoy (not to mention understand why I detest others) and understand a bit more about the comic strip process. However for me, the highlight of the convention was the fact that Moniaive went beyond the fourth wall and had a real live academic expert (Shut it McShane!) in the shape of Dr Michael Dempster with his panel on Scots Language in Comics tracing the portrayal of Scots from the 1740s to the present day. I felt a wee bit guilty as he kept giving me lines where I could fill in the blanks such as Young Middenface in the Megazine bearing more than a nodding homage to the Young Dirky stories of days gone by that were published by D C Thomson or the fact that a fondly remembered column from The Weekly News would feature tales from the courts where everything would be reported in grammatically correct English until it came to the quotes from such illumaneries as Big Bella or Wee Shug where every comment would be precisely recorded in pure Scots. This was in between translating some Scottish terms to a bemused Steve MacManus, who steered 2000AD to such glory days, and laughing like a drain at some of the jokes aimed inwards at some of our parochial attitudes and outwards at those that think tartan, shortcake and haggis are all that make up the Scottish identity. To sum up, while the first Glenrothes Comic Con was as welcome as a double malt from the SS Politician, Moniaive is comic speak for Shangri-La.